- After two years of putting off winter hiking in the Adirondacks it was finally time to head up to the High Peaks and tackle the Forty-Sixers. 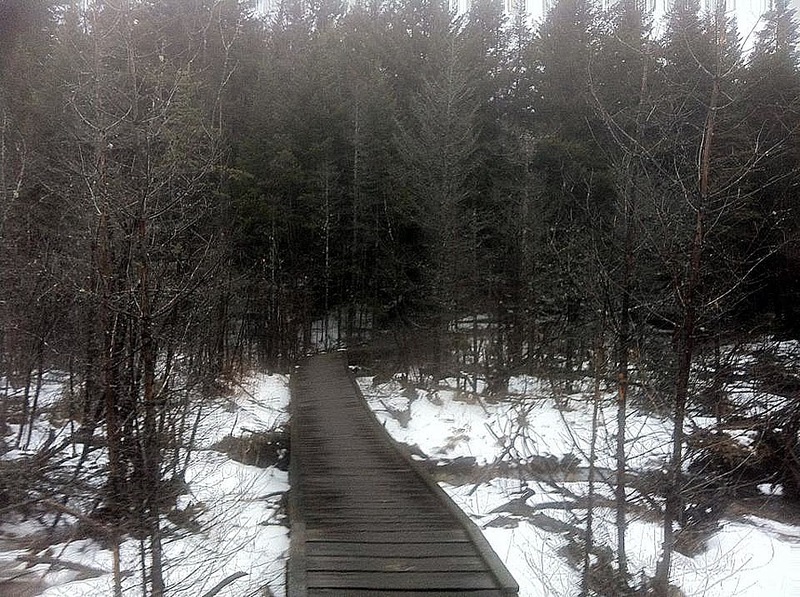 I was looking forward to snowy conditions and dramatic views, however, the weather had other plans as a warm front came through turning the trails into a sloppy spring conditions mess! - Temperatures were in the forty's throughout the hike, there were no views, and there was a light drizzle and showers that fell throughout the hike. - I started off on the Van Hovenburg Trail that leaves from the ADK Loj trailhead. The ADK Loj and the Van Hovenburg Trail are usually some of the busiest places in the High Peaks, but today there wasn't much activity. I packed up my gear in the iced over parking lot and chatted with a guy who was planning to spend a night with his buddy and attempt to ascend Mount Marcy either today or tomorrow. - I set off just before 8:30 in the morning and put on my microspikes right away as conditions were a little whacky to say the least! 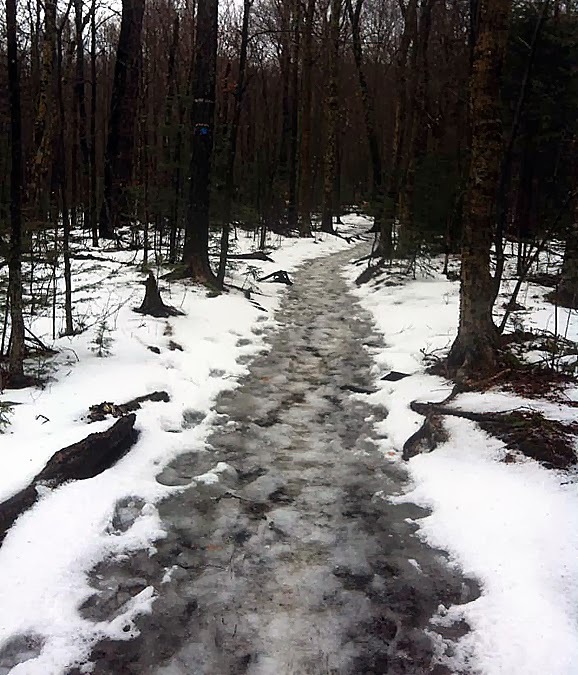 Ice, snow, slush, and standing water blanketed the trail as I made my way to Marcy Dam. The Van Hovenburg Trail is pretty tame, it's a nice walk into Marcy Dam with a few ups and downs and the trail is marked with blue plastic discs. - Around Marcy Dam there are designated campsites and lean-to's everywhere, usually these are bumping with activity but with the awful weather blanketing the region no one was to be found. 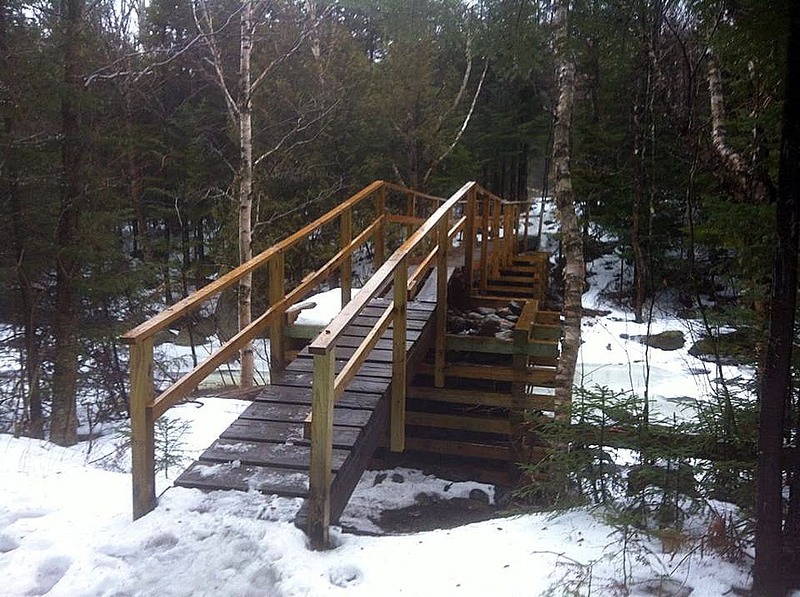 - I forged my way past Marcy Dam, crossed Phelps Brook on a snowbridge that was still stable, for now, and made my way to the Phelp's Trail Junction. - The Phelp's Trail is just over a mile to the summit and never gets too steep. The trail was a mess as the warm weather ruined the packed snow. It was the equivalent of hiking through a Layer Cake, as there were a couple of inches of standing water, with a couple more inches of slush on top, with yet a couple more inches of snow on top. I started punching through pretty badly so I put on my snowshoes, which only helped a little. I kept falling through but I wasn't slipping around anymore so that was a plus. - I finally reached the summit and wandered around for a bit before heading down. It was raining pretty hard and the wind was whipping but I wasn't too cold since it was unseasonably warm out. 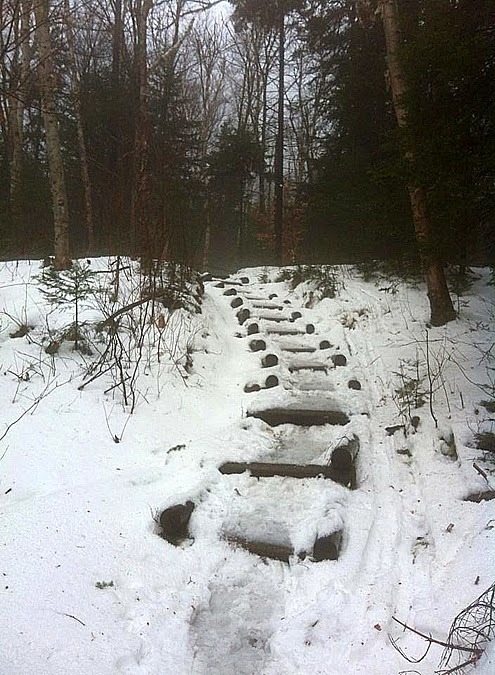 - I booked it back down the Phelp's Trail, slipping and sliding every couple of steps, by now I was soaked, even my waterproof boots started leaking as every other step I sunk in about a half foot into freezing water. - Back at the Van Hovenburg Junction I decided to head back to my car instead of heading up to Table Top Mountain. I was hoping there would be some other crazy hikers out there wanting to do both but I didn't run into anyone until about a mile and a half from my car. 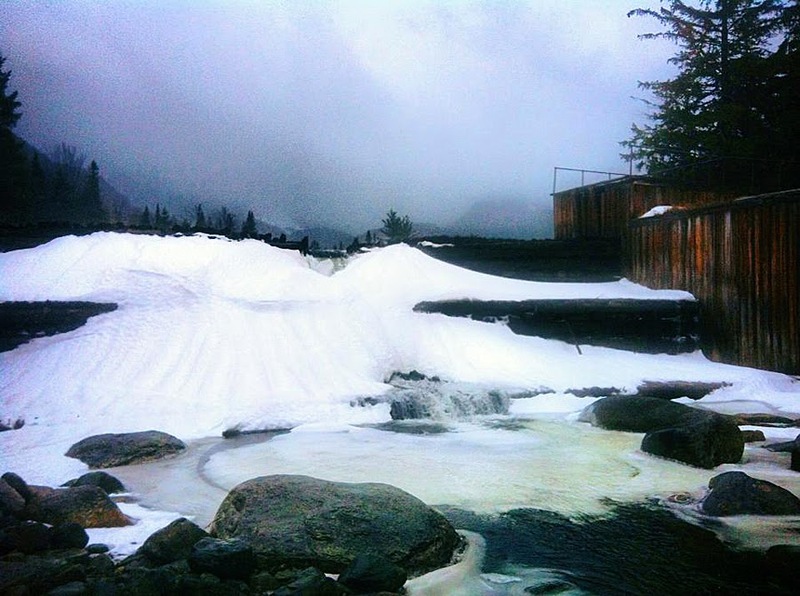 - The walk back was uneventful, I did get a decent view of the Wright Peak slides from Marcy Dam. - Back at the car I changed into dry clothes just as it started to pour, perfect timing! Beautiful views from the summit today! Wright Peak slides, one is called Angel, the other one I forgot, I want to say squirrel but it looks like a rabbit or dog to me! Nice pics, particularly of Marcy Dam. I made a halfhearted attempt of Dix from rt73 on the 21st. Soggy and foggy conditions. When it started to rain I aborted the mission. Though prepared, my primal survival instincts demand that I get out of the weather when it's "cold" and raining. Oddly, my primal instincts don't tell me to stop hiking the ADK peaks in the winter. Have fun this winter! That sounds like a cool route to Dix, I'm hoping one day to check it out. Yeah, the weather was crummy, when I get cold and wet I head back to the car ASAP, changed into warm clothes, and make my way to a bar! Have a great winter out there hiking, too!